(Phys.org) -- Running a diesel like engine on gasoline is something Delphi is doing in notable fashion. They claim they are on to a promising way to enjoy an engine that gives the vehicle owner high efficiency and low emissions. Delphi, a major Michigan-based auto-parts supplier, is developing this technology which has shown impressive results in tests. Delphi tried out its combustion concept, which reaps the best of two worlds of low-emission gas and efficient diesel engines. Delphi claims its technology is an improvement upon the fuel economy of gas-powered cars, and can bring forth benefits of the hybrid at less the cost of a large battery and electric motor. Tested on a single-cylinder engine, Delphi's approach is called a gasoline-direct-injection compression ignition. Engine-operating strategies leverage advanced fuel injection and air intake and exhaust controls. The researchers wrote a technical paper on the subject, which was presented at SAE, an association of engineers and other experts in aerospace, automotive, and commercial vehicle industries. Delphis team, Mark Sellnau, James Sinnamon, Kevin Hoyer, and Harry Husted are the authors of the paper, Gasoline Direct Injection Compression Ignition(GDCI) Diesel-like Efficiency with Low CO2 Emissions. Their experiments were carried out on a Ricardo Hydra light-duty single-cylinder engine, which they said was considerably flexible, with parts that can be easily interchanged. Tests were conducted at 6 bar IMEP - 1500 rpm using various injection strategies with low-to-moderate injection pressure, they said. Their results showed that what they called triple injection GDCI achieved about eight percent greater indicated thermal efficiency and about 14 percent lower specific CO2 emissions relative to diesel baseline tests on the same engine. The researchers reference to triple injection GDCI refers to their approach of injected gasoline in three precisely-timed bursts, avoiding the rapid combustion that has caused past experimental engines to be noisy. They also succeeded in burning the fuel faster than in conventional gasoline engines, to get the most out of the fuel. Mark Sellnau, engineering manager of advanced powertrain technology at Delphi, says the engine could be used along with a battery pack and electric motor, as in hybrids, which may improve efficiency still more. He also added that it was not clear to him whether the cost of doing that would be worth it. When Big Oil's back is against the wall, innovations in ICE's suddenly appear. For decades, cars have been running inefficiently, in concert with the fuel makers. We need to be rid of fossil-burning vehicles, including ocean-going tankers that pollute the equivalent of fifty million cars. Enough already. Tele you are 100% correct. I worked for a big oil company in the 70s and they bought millions of 100MPG carburetors in order to keep them off the market. Also, they must have had 100,000 pallets of those pills that you add to water to create gasoline. After a while, they needed the room so I had to dispose of everything. Well I did not and had it all moved them all to my private warehouse. I can make you a good deal on the stuff, $100,000 for everything. But soon this does not matter, since devices like Rossi's and Brillouin Energy will stop all this fossil fuel pollution. The government has this car, man, you know? And get this: it runs on water, man! WATER! It's rather silly to compare the efficiency of this to a hybrid's. They are apples and oranges. The purpose of this direct injection work is to increase the efficiency of the IC engine. The ultimate purpose of a hybrid system is to increase the efficiency of the entire system, most notably through the recovery of kinetic energy lost to braking. Eventually, small battery/capacitors with a electric motor and super-efficient IC engines will rule the day (the opposite of the Volt or Fiskar). And, like, dude- while they were testing it, the dude driving it had been brainwashed by the bigwigs at exxonmobil to sabotage the vehicle, cause, like, they don't want a car that runs on water! well, anyway, man, the driver crashed the car so far down in a canyon, that it took five days to get to it, and man -get this: "Stairway To Heaven" was still playing on the cd player, dude!!!! Now if we just had some nifty enzyme to separate H2O into hydrogen and oxygen, we COULD use water. Then we could collect the emissions (H2O) and funnel it back into the enzyme tank and use it again. That would really screw things up. 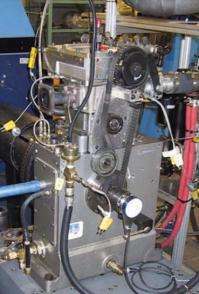 Yes, this type of engine has been tried before, and featured on physorg. If I'm reading the article right, they're actually saying the gas compression engine actually outperforms the diesel version. That could be interesting...because that would equate to something like a 50% increase in gas mileage. as to the 100 MPG carburetor, you really should leave those comments somewhere else. Last I checked, this is a science site, not a conspiracy theory site. Also, have you ever heard of snopes.com?? "For decades, cars have been running inefficiently, in concert with the fuel makers." So that guy, you consider the above statement to be of a "scientific" nature. I was just pointing out the stupidity of the above statement. I sat next to a Canadian oil engineer on a plane to Vancouver in 1977. He told me about his friend in Saudi Arabia, a fellow engineer who rigged his eight cylinder pickup truck to get 80 mpg's, with direct-injected gasoline vapor. He also told me that jet engines were deliberately designed to guzzle fuel. I'll just chalk up your clumsy sarcasm to youthful naivete. The above was from the last activity of "geokstr", Feb 22nd, which I find astounding that he has the nerve to participate in rating comments. Geokstr and CaptainSteve are one and the same ignoramus. Wow, you still believe that fraud do you? If you would check the research done in LENR or what name suits you, you would notice that there is excess energy released. The problem has been how to control it so that it can be reliable. It's a bit like with superconductors. We know they work, even if we don't have good theories explaining them. - range of speeds and loads? - environment sensitivity (temperature, humidity, etc.)? There can be no argument that greater efficiency is a very good thing. Decades ago we were told that the mileages we are achieving today were not possible, yet they are. What I am curious about is what was it about my earlier comment that got it rate "1" by a couple of people? You should know I am NOT offended by a low ranking on a comment, but I am curious about this one. Was I not serious enough about the subject, or what was the issue? I am naturally interested in what motivates others. Being rejected usually tells you more about them than it does about you. Months ago, one person here messaged me and explained his "1". I appreciated what he told me. He made sense and I thanked him for that. I actually expect 1's for some of my comments. I do think it would be great to continuously recycle the same fuel, although I'm quite sure that's not possible with water. So, not to take away from the article, I am truly curious, but not offended. Really. It would be interesting to know why. Mando it takes some sort of energy to decompose water. So even if you managed to find this magic enzyme it would still have to have an energy source such as sunlight or a carbohydrate in order to function. What you have described is a type of perpetual motion machine. This very forum could be the subject of a PhysOrg article- "Adolescent Brats Find Release of Sexual Frustration by Indiscriminate Use of Ones in Rating System." You should realize, MandoZink, that this world is made up of thoughtful people who have healthy, intelligent responses to sincere opinions, but you'll also find the opposite here who have been pegged long ago as society's detritus. They're also skeptical if not oblivious to the seriousness of our global predicament, and revel in their ignorance like pigs in their own excrement. I wouldn't take it personally if I were you. I do think the caliber of this forum has fallen considerably. It's a shame, but otherwise, it's a mind-expanding experience. Thank you MR166. That's exactly the kind of answer that should be expected when posing a "what if" comment here. I didn't actually mean to imply I thought an enzyme could split water. I still remember asking Brother Lawrence a similar question about H2O in Advanced Biology back in high school in the late 60s. That's when I learned not only how amazing enzymes were, but how much energy it could take to bind atoms and molecules. I was intrigued that enzymes could do work catalyzing and keep on ticking. Br. Lawrence gave me no hope that would ever happen with water. My physics classes later on pretty much confirmed that. It's funny that I also got a "1" for my ratings question. I guess you're right Telekinetic! MandoZink, that this world is made up of thoughtful people who have healthy, intelligent responses to sincere opinions, but you'll also find the opposite here who have been pegged long ago as society's detritus. A few weeks ago I re-visited the descriptions of different types of trolls and their approaches. It was as fascinating as many science topics, although inevitably disgusting, bordering on the sociopathic. I wouldn't take it personally if I were you. Don't worry, I don't. I'm just not insecure about that. As I stated before, being rejected usually tells you more about them than it does about you. That truism makes it easy to avoid dejection, especially during those social dating periods in your life. ..I worked for a big oil company in the 70s and they bought millions of 100MPG carburetors in order to keep them off the market. Also, they must have had 100,000 pallets of those pills that you add to water to create gasoline. After a while, they needed the room so I had to dispose of everything. Well I did not and had it all moved them all to my private warehouse..
Having worked with large industrial companies and also been a public company director I can inform that oil companies don't buy finished product to somehow make it escape the market as that results in income for the seller. Such claim makes zero economic sense but if true would enrich the seller to produce more product ! There is no thermodynamic capacity for a 'pill' to convert water (an ash of hydrogen & oxygen) into a hydrocarbon even if CO2 were a feedstock. No, because it is just a statement. Science is a method. statements are rhetoric. apples and orange trucks. That said, you could probably prove it moderately true (Through oil co pressure and carmaker complacency), while still disproving the conspiracies. I'm not sure why you're intending to single me out here, because obviously I'm not especially partisan, my previous comment having touched all sides of the issue. Okay. This is for those who remarked on my delusional comment earlier where I thought it'd be nice to use H2O as fuel, capture the water vapor exhaust and covert it back into Hydrogen and Oxygen using a catalyst. I accidentally ran into this article. It's sorta being done. They claim to recover oxygen and a more stable form of hydrogen called Hydrino, while generating electricity in the process - using water as fuel. "Electricity generated from water: BlackLight Power announces validation of its scientific breakthrough in energy production"
I didn't really expect to see this and I'm not really sure what they're doing. A nice diagram of the process would be nice. "New stable form of Hydrogen"
Would be nice if they authored a full peer reviewed paper ! Ha ! H2O is not a fuel. It isn't even a energy storage medium ( battery). The energy content in the chemical bonds of H2O extremely low (as is the case for most all other stable molecules). H2O (and CO2) are the END-products of combustion for a reason: All the energy has been released in the combustion and the stuff that has low energy content is left over. You can't go around 'burning' hydrogen and oxygen to get water and electricity (in a fuel cell or copmbustion reaction) and then convert H2O into hydrogen and oxygen (or 'hydrino') and expect to get energy AGAIN from that reaction. Otherwise you'd have just invented a perpetuum mobile. "Hydrino-Theory" is a scam. On even a more dumb level than cold fusion. My initial post was an addition to jscroft's "govt. conspiracy" comment. I didn't actually consider this other that a joke. A few days later I run into that very same "pipe-dream". They have a website with links to some published papers. I couldn't begin to understand what they were talking about. A Wikipedia search of "Hydrino" refers to this company. I'm a bit confused by some of the claims in the article. First, BTE is mostly a function of cycle pressures, cycle temperatures, heat release rates, and mechanical efficiency. Second, as a fuel diesel has a greater energy density (LHV= Btu/lb) than gasoline. Third, regarding CO2 emissions, under optimal combustion conditions the exhaust byproducts are mostly CO2 and H2O. Gasoline and diesel fuels are both primarily composed of hydrogen and carbon. Lastly, classic DI CI diesel combustion occurs mostly at constant pressure conditions. However, constant pressure combustion is much less efficient than constant volume combustion. The only way I can see this GDICI system having a higher BTE than a diesel is if the combustion is occurring at constant volume conditions. To those of you who believe in the conspiracy that evil world wide corporate interests have squashed 100mpg carburetors, do you oppose socialism? The only way such conspiracies could ever be true is with the complicity of all world governments to protect the corporations and to stifle their own research efforts. After all, the US govt spends a lot of money on fuel. Limiting the power of the state to control businesses would open the door to competitors, if they existed. Why would oil companies NOT want 100 MPG engines or carbs? That would be a net DROP in emmissions/miles driven, Allow them to charge $20/gallon and their present production and distribution networks would be able to handle future demands without as much outlay for capital expenditure. While it looks like their charging by the gallon(litre), they're REALLY charging by the mile. When the Volkswagon Rabbit ushered in the widespread super milage diesel car for the masses (as opposed to relatively few Mercedes,et. al.) the price of diesel shot up. Another point: Jet engines are DELIDERATELY inefficient? Yeah, the Military and the Aviation industry aren't really interested in efficiency and/or greater range. Oh PLEASE! Get real! What automobile manufacturer wouldn't want to be the FIRST to proclaim 100mpg? Yeah, the thought of trying to keep up with demand is just to frightening... Add a conspiratorial angle to any theory and the results are trulY AMAZING! Combustion engines should all be in the bone yard. I'm ready for electricity. Buy one. What is stopping you? There are all sorts of electric vehicles that can be purchased. ryggesogn2, you are correct. the purchase of an EV is not a problem. The problem(s) are range, utility, energy resupply (I don't want to hang out even 45 minutes to refuel.) If the vast majority buys an EV, how will the Grid handle that MASSIVE load? Where does this energy come from? The "Green Machine" doesn't like fossil fuels OR nuclear power. Solar? How long until that much BASELINE Solar(solar with storage) can be brought to bear? For an individual, no problem, for infrastructure for the Masses? Lots of unsolved issues. Jevon's paradox will negate any efficiency gains. Mention of cars gets the rev heads out of their corner. If it is not Cold Fusion it is not a breakthrough. While Corrupt Corporations in America might keep a 100 mpg carb. off the market, it would just be adopted by the communist nations who would benefit from it's greater efficiency. I stopped driving 4 years ago.